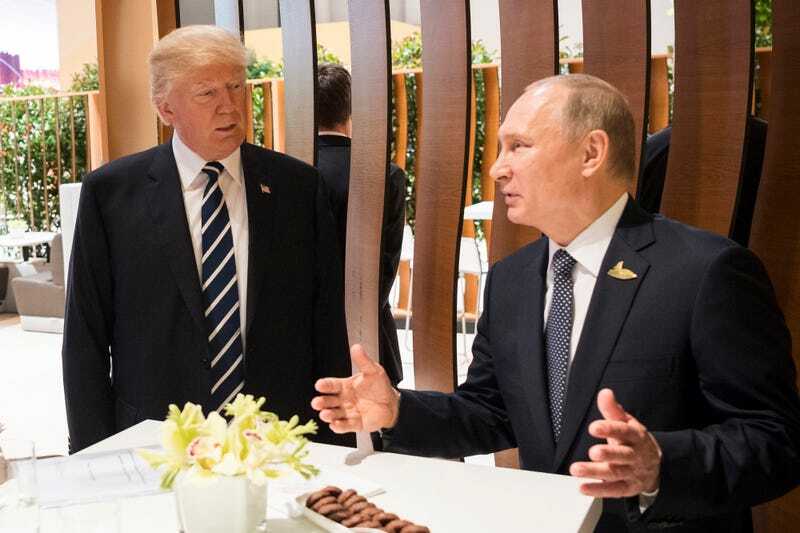 While the president of the United States holds paper-airplane-throwing competitions inside the Oval Office against chief of staff John Kelly and Secretary of Defense James Mattis (yes, Kelly and Mattis manipulated their airplanes so that the president’s paper plane flies farther), Russian president, and America’s play cousin, Vladimir Putin is boasting that he has nuclear weapons that can’t be intercepted by U.S. missile defenses. On Thursday, during his yearly state-of-the-nation address in Moscow, Putin claimed that Russia now owns the long-feared doomsday device that only science fiction writers and, maybe, Russia dream of. Putin boasted of five new weapons systems that he claimed are all nuclear capable. One weapon Putin described as a “low-flying, difficult-to-spot cruise missile ... with a practically unlimited range and an unpredictable flight path, which can bypass lines of interception and is invincible in the face of all existing and future systems of both missile defense and air defense,” the BBC reports. In true Putin fashion, he didn’t actually show the weapons, which all sound like the nuclear equivalent of a shark carrying an alligator on its back. According to Putin, who lies about as much as the current U.S. president, Russia has crafted undetectable weapons that can do all kinds of amazing destruction, and America better pay attention! A computer-generated animation accompanied each weapon announcement, perhaps illustrating that they exist mainly in a conceptual state. First, Putin mentioned a new intercontinental ballistic, which he claimed had unlimited range and could get past all US missile defenses. Next, Putin announced what he called a “global cruise missile,” which he claimed had unlimited range and was nuclear-propelled. An animation showed the missile fired from Russia’s north, flying north of Europe into the Atlantic, weaving through US air-defense zones, and then inexplicably traveling south the entire length of the Atlantic Ocean before wrapping around Argentina and ending up near Chile. Then, Putin seemed to confirm a long-feared “doomsday” weapon: an unmanned, undersea vehicle capable of carrying a nuclear weapon across oceans at high speeds. While it may have only been computer-generated destruction of the West, it proves that Russia is not our friend, so it may be time for President Donald Trump to stop emailing Putin about which workout classes he’s taking and how he makes his three-bean chili dip, and start treating Russia like the threat it has always been.